Spring has arrived late in my garden. Early spring flowers are blooming as if it’s the middle of March, not Mid-April. 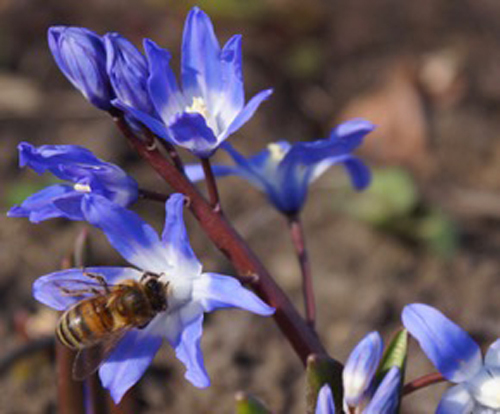 Little Chionodoxa forbesii might be a common spring garden flower, but it is a welcome addition for bees and its colour shines from the border on dark, misty days. 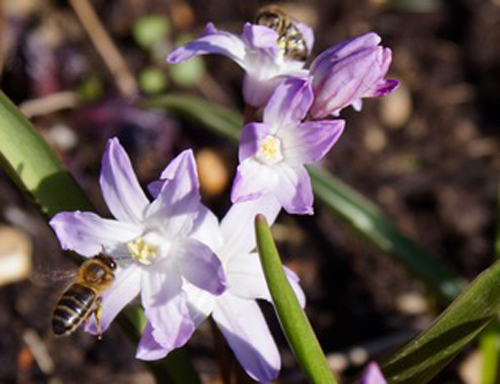 Chionodoxa ‘Pink Giant’ might not have the same impact as the blue form on a miserable dank morning, but the bees appear to love it all the same. The earliest tulip in my garden is Tulipa turkestanica. It reliably reappears every spring, although like Chionodoxa, it is a month late this year. It is a wonderful pollinator magnet, and works well alongside the plant that was ubiquitous during my childhood, Aubrieta. 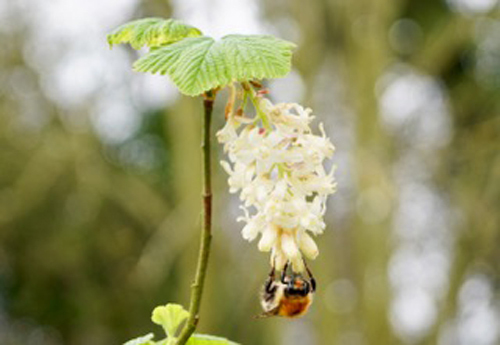 The flowering shrub of the moment as far as bees are concerned, is Ribes sanguineum WHITE ICICLE (‘Ubric’). In the fruit garden, the mirabelle hedges are hugely popular with bumble bees. My optimism for a magnificent harvest is at its height. Then again, like many gardeners, I tend to be at my most optimistic about my garden in April. By June I will be battling an infestation or three, and resigning myself to fewer fruits and less than amazing borders while hoping that next year the garden will reach the pinnacle of floral loveliness and I will be up to my ears in gluts. This year though, the recent milder weather is encouraging new blooms to open daily. Pulmonaria is smothered in flowers. I have added ‘Mrs Kittle’, and a new one from Beth Chatto’s nursery, ‘Patric’s Early Dawn’ to my collection. 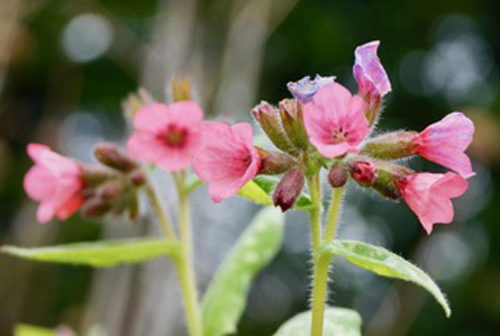 Time will tell if they are as popular with hairy-footed flower bees as Pulmonaria 'Diana Clare’. It has been a long wait, but spring has finally arrived in Norfolk. The forecast for next week is promising, and I hope that we will all spot more butterflies and bees. 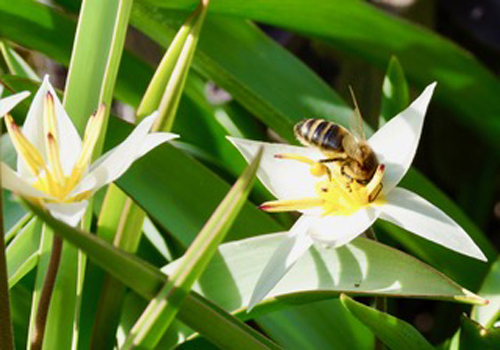 I would love to hear about the plants attracting pollinators in your gardens. I will be linking this post to Garden Bloggers’ Bloom Day hosted by http:// www.maydreamsgardens.com where you can find a list of blogs featuring plants in bloom in the UK and elsewhere in the world. 3 Comments To "On the Menu for ... April 2018"